Oil Level Inspection Window Clear Again! Yes! The oil level inspection window is clearing up! This is after 2 oil changes. Also, I noticed that the inspection window tends to clear up after a ride – when the engine is warmed, but will return to fog up again when cooled down. 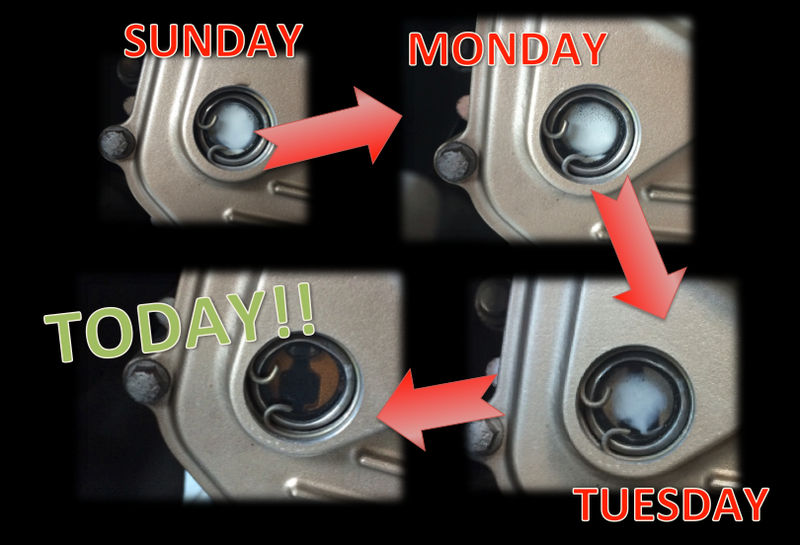 So what I did was to open up the oil fill knob every time I park my bike after a ride. This lets the engine-warmed steam to evaporate out through the oil fill hole. Yes, the window seem to suggest overfilling – which I intentionally did. Because if I didn’t “overfill”, the oil will never reach the full height of the window to “clean” the fogged up lens. It’s been about 60km or so since my last oil change. Considering that it’s presently mineral oil and that I believe in the protective qualities of synthetics, I’d probably let this run till about 500km or so before I change it back to some fully synthetic oil.